This study has 13 sessions, incorporating an introductory session and 12 lessons. 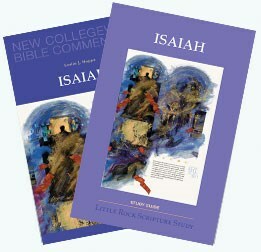 The study set includes the Study Guide by Clifford M. Yeary and Catherine Upchurch, and the New Collegeville Bible Commentary, “Isaiah,” by Leslie J. Hoppe (Liturgical Press). Leslie J. Hoppe, OFM, is an adjunct professor at Catholic Theological Union after serving on its faculty for twenty-four years, and serves as the provincial minister of the Assumption Province Franciscans. He has written several books on biblical studies and archaeology, including The Holy City: Jerusalem in the Theology of the Old Testament (Liturgical Press, 2000). He is a former editor of The Bible Today and currently serves on its editorial board. In the Bible, the primary role of the prophet is to speak for God, to see and hear as God sees and hears, and then to pronounce words of correction and hope. In Isaiah, we encounter God's accusation against Israel; the holiness of God; hope for a messianic king; oracles against foreign nation; prophecies of restoration; and challenges for exiles returning to their homeland. The book of Isaiah is quoted in the New Testament more often than any other Old Testament writing other than the Psalms. It is a compilation of the prophetic work of an eighth-century prophet (chs. 1–35), an exilic disciple called Second Isaiah (chs. 4—55), and postexilic writings called Third Isaiah (chs. 56-66).